"For 13-year-old Leah Maxey, the trip was a lifetime in the making. She and her parents, Robert and Kathy Maxey, had been talking about a trip to China 'pretty much ever since I can remember,' Leah said. Last month, they finally went." 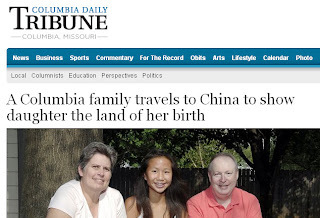 Read the Maxey's full story on their Return to China trip (featured in the Columbia Daily Tribune), as they experienced Leah's birth country for the first time since their adoption trip in 1999. Adopted children have been coming home from China since the country opened to international adoptions in 1992. Many of our sons and daughters are old enough now to visit their homeland and see with confident eyes the land where they were born. Is the time right for your family to Return to China? Learn more about homeland tours. We are currently setting dates for SUMMER, 2012 RETURN TO CHINA travel.